Anyway, I had this big grand plan for this post where, before announcing the winner, I'd do a sort of My Favorite Answers thing, but then that fell by the wayside when a) pretty much every answer became my favorite (this happened mostly when the pairings were food and I was hungry), and b) I realized I need to be at the airport at 6:30am tomorrow morning for my flight to New York, which means getting up at half past Way Too Early o'clock. I will say this however: wine and cheese seemed to be the most popular combination, although apple and cheese was right up there too, which was hardly a surprise. What I wasn't anticipating, however, was how many people confessed that they like to dip their french fries into some sort of ice cream/milkshake concoction, and also HOW I WASTED THE FIRST 29 YEARS OF MY LIFE NOT TRYING THIS. So! Without further ado, I give you the winner, who was determined with the very scientifc help of random.org, which did all the heavy lifting and the hope-dashing and the miracle-working while I just sat back and peeled some grapes with my toes. 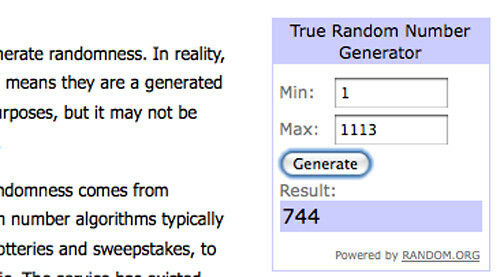 And the winner is number 744! Who is number 744? Is it you? Well, not unless your name is Chirky it's not. Congratulations, Chirky! You're the proud owner of a Clarisonic Skincare Pair, which means two fabulous Clarisonics will soon be on their way. I predict you will now have many long-lost friends and relatives coming out of the woodwork to take the second one off your hands. Perhaps even strangers too. "Chirky!" they will say. "Don't you remember when I let you cut in front of me at the grocery store that one time because you were only buying toilet paper and orange juice? We're practically BFFs!" To the rest of you, my condolences: it was a good run and a fair game, and I really enjoyed hearing from all of you, even though I know you were only doing it because you wanted to win something. (Ha!) (No, really. Don't be a stranger, okay?) And now I have to go to sleep because I need to get up in about twelve and a half minutes to head to the airport to catch my flight to LaGuardia, where I'm going to be stationed for the next 48 hours. That's not a typo: I'm going to live in the airport just like Tom Hanks in The Terminal, except not really because I'm only going to be there from 6am to 6pm, so it's more like...part-time living, I guess. It's a thing for work, which I'll tell you more about the next time I check in. Oh god, now I have to get up in eleven minutes. Oh, darn. I really had convinced myself that winning this was going to be the first in a string of very lucky events to whirl me into a great-happy-go-lucky holiday season (not to mention doing so with glowy cheekbones)...Now I have to convince my husband that he needs to get me one for Christmas because I can't LIVE any longer with out Clarisonic fabulous skin. Oh... just the mention of french fries and a milkshake makes me want to run out to Wendy's at lunch to pick up some fries and a Frosty. I love doing that!! Holly! When I saw my name, my heart dropped into my stomach and my face got hot. And then I checked the link you posted to see if maybe, out of 1113 entries, there was another Chirky. But apparently there's not! I won! OMG! Thank you Holly and Clairsonic! My sister and I started off the french fries and ice cream thing at McDonalds in our younger years just to gross out our mom, but then we realized how awesome it was. I still do it! There is something so perfect about all the contrasts: hot and cold, salty and sweet, soft and crunchy. Damn it, am I going to have to walk to the nearest McDonalds at lunch to fulfill my sudden craving for this?! You'll have to report back to compare the airport experience and how it compared to the Las Vegas terminal. What do you really do there? live surveys? just observe people? Seriously? You've never done the chocolate shake/fries thing? Go to Wendy's and get a Frosty.